Xiaomi Redmi Note 4 was officially launched in January 2017. The smartphone gets a 5.5-inch full HD IPS display with a resolution of 1920×1080 pixels. It sports a 2.5D curved glass design. Xiaomi Redmi Note 4 is available in two storage variants – 3GB RAM+32GB storage and 4GB RAM+64GB storage. Redmi Note 4 is powered by an octa-core Snapdragon 625 processor, which can be clocked at up to 2GHz. It runs MIUI 8, which is based on Android Marshmallow. 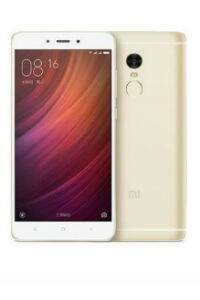 Xiaomi Redmi Note 4 features a 13MP rear camera with 1.12μm pixels, PDAF, f/2.0 aperture and LED flash. Other features of the camera include BSI (Backside illumination) technology and 5-piece lens. The rear video camera is capable of recording 720p@120fps slow-motion videos. Xiaomi Redmi Note sports a 5MP front camera with f/2.0 aperture. Xiaomi Redmi Note 4 is backed by a 4,100mAh lithium-ion polymer non-removable battery. Sensors on the phone include Electronic compass, Accelerometer, Proximity sensor, Infrared, Ambient light sensor, Gyroscope and Hall sensor. Connectivity options are: Wi-Fi 802.11 a/b/g/n, Bluetooth 4.1, Bluetooth HID, Wi-Fi Display and Wi-Fi Direct. Xiaomi Redmi Note 4 measures 151 x 76 x 8.45 mm. Xiaomi Redmi Note 4 is available in three colour options- Black, Gold and Dark grey. Xiaomi Redmi Note 4 is priced at Rs 9,999 for the 3GB RAM +32 GB storage version, and Rs 10,999 for 4GB RAM+64GB storage.